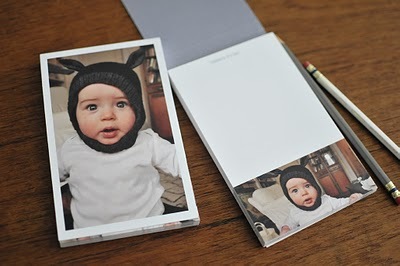 The Short and the Sweet of It: Adorable Photo Notepads! I was just perusing Cup of Jo (Joanna has great ideas for new mom wear and baby gifts), and I'm just smitten with these darling photo pads from Pinhole Press. Joanna made this darling one featuring her little boy Toby. These are great gift ideas for any new parent (of new babies, or puppies for that matter)!